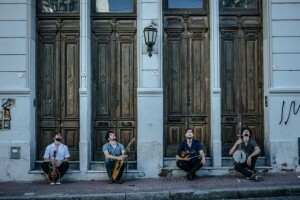 The mambers of Che Apalache are (from left to right): Martin Bubrik on mandolin, Franco Martino on guitar, Joe Troop on fiddle and Pau Barjau on banjo. As unlikely as it seems, that certainly has been the case in Buenos Aires, where Joe Troop, Martino Franco, Pau Barjau and Martin Bobrik have created a cross-cultural musical friendship they call Che Apalache, blending bluegrass instruments and bluegrass techniques with Appalachian and Latin American music to create a new sound they call Latingrass (which is also the title of their first album). Che Apalache is headlining a Sept. 14 concert at the Smith Opera House in Geneva with Jorge T. Cuevas & The Caribe Jazz Allstars opening. The concert, along with three Latinx-themed movies on Sept. 13, 15 and 16, are in support of Geneva’s Festival Latino, which runs Sept. 14-16 at Lakefront Park. (see sidebar below). Finger Lakes Live will also have two events in support of the festival. “Bluegrass is our home base and we go outward from there,” explains Troop in a recent phone chat that took place while the acoustic quartet were driving through the Mojave Desert on their three-month U.S. tour. That “outward” could land them on a 1960s TV theme song “The Ballad of Jed Clampett” (Beverly Hillbillies flashback alert), or an Argentinian tango such as “Cambalache.” Or it could thrust them to a politically charged a cappella original such as “The Wall,” written by Troop and sung in fine four-part harmony with Martino, Bubrik and Barjau. In Argentina, che is a casual term of familiarity that might best be translated as buddy, pal, bro or sis, and Apalache is Spanish for Appalachian. How Troop, Martino, Barjau and Bobrik found Appalachian musical buddies is a 21st century story with YouTube, cheap Chinese imports and Troop’s need to make a living as its pillars. Troop grew up in bluegrass-steeped North Carolina and and got hooked on the sound as a teen. By the time he was in his mid-20s he was a globetrotting polyglot (fluent in Spanish and Japanese) and multi-instrumentalist (banjo and fiddle are his go-to sounds) recording with fellow American folksters (he made an album with Aaron Jonah Lewis titled “You Bring Out the Hamster in Me”) and touring with Chinese erhuist Guogan Li. “I like to stretch in general, in all ways: musically, emotionally, philosophically,” he muses. When Troop moved to Buenos Aires in 2010, he chose music teacher over restaurant server as his prefered method of scraping by. 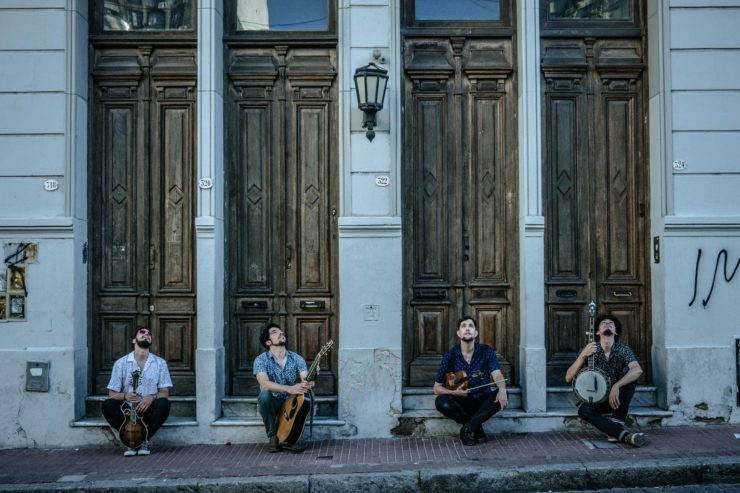 While the rest of the world may have been introduced to bluegrass through American movies, Bugs Bunny reruns, and YouTube tutorials, Buenos Aires was hardly a hillbilly hotbed. Thankfully for Troop, however, music stores were awash with cheap Stagg banjos from China that would arrive in bundled packages along with guitars and other more popular instruments. Consumers bought these plucking oddities in of a flash of curiosity, then went to Google to find Troop, probably the only banjo tutor in a city of 15 million. After a few lessons, most students moved on to new obsessions. But Bubrik, a Buenos Aires native who plays mandolin, and Barjau, a transplant from Mexico who plays banjo, stayed the course. Already dedicated rock musicians, the two similarly fell in love with and excelled at bluegrass. Troop graduated them to bandmates, and along with guitarist Martino the “che-hood” was born. “I never wanted to be a music teacher for the rest of my life. I wanted to be a performer traveling all over the world,” says Troop. And Barjau is grateful for the new world that bluegrass has opened up for him. “I was starting to play (banjo) badly and learning from YouTube. Friends told me about Joe, So when I went to take my first lesson, he said. ‘You need to learn bluegrass to get it,’” recalls Barjau. For more information, go to https://www.facebook.com/GenevaLatinoFestival/. Finger Lakes Live at 427 Exchange St. is hosting two nights of music in support of Geneva’s Festival Latino. Contact the venue or visit its website, www.fingerlakeslive.com, for ticket information and more details. The Smith Opera House at 82 Seneca St. is presenting three movies and a concert in support of Geneva’s Festival Latino. Sept. 16 at 7 p.m.: Angelica (not rated). Following the screening will be a Q&A with director Marisol Gómez-Mouakad. Admission for films is $7, free for children 12 and younger. Admission to the Che Apalache concert is $15 plus service fee. For more information go to the links listed above or call 315-781-5483.